Met with Hassy and Andy for another skate filming session in Sapporo today. We met at 1pm at the new Hot Bowl in Shin Kotoni. They are normally closed on Wednesdays, but opened special for us to film. Deka-cho and Matsui Katsushi also came and sessioned the still very new bowl. What a great place they have built there, and thanks go to the Hot Bowl staff for a good session. I’ll be back again soon to ride there on my own. It costs 5,000 yen to join as a member and then 2,000 yen for a day pass. Maybe a little expensive, but the bowl is sweet and probably never really that crowded. Hassy and Andy were riding super good as always, although Andy was maybe a little tired after having been in Niseko yesterday snowboarding, skating and drinking. Those guys are tough characters and they always ride hard. 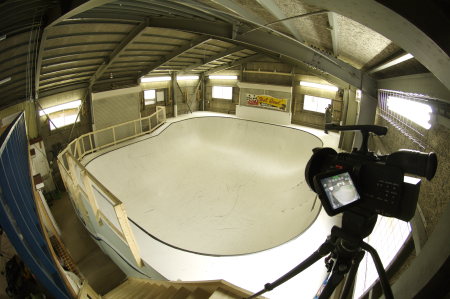 I have so much skate footage now from these last two sessions not sure how to fit it all in the movie…. hmmm more editing dilemmas. The Hot Bowl, getting ready to film. Andy around the big corner. Man does he ride fast…. Tomorrow off to Niseko Hirafu for one more day of filming with Hassy. He goes back to main island tomorrow night. Will see if we can film anything in the Hirafu Park tomorrow. This will be my first trip to Niseko this season! Went up to Kokusai today for a few runs. Love that spring snowboarding. No skiing today. Got there at 9am right when the lifts start, wanted to get in a few runs before the snow gets too soft and sticky. 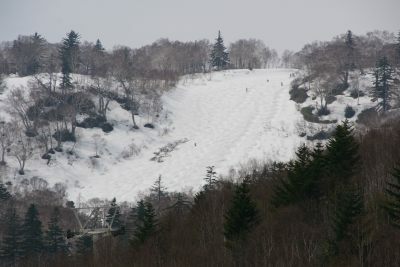 Turns out that it had actually snowed about 5cm the day before so it was sticky right from the first run. I tryed to slash a bank on the side of the course and instead did a major front flip to hard shoulder landing. Headphones and goggles flying off…. How could I forget that warm spring snow does not slide…. 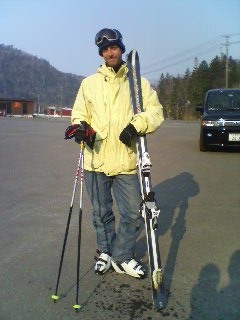 Uemura came by after my third run and joined me for a few laps on the top lift. Then one more good run to the bottom. The bottom of the mountains is a narrow trail with little banks to hit along the sides. They had covered that section with salt so it is hard and fast. Then you hit the bottom flat section and almost come to a stop. Anyway lots of fun. Should be good boarding right through the end of golden week. Here is what the downhill course looks like from the parking lot. It looks pretty good, but the moguls were super sticky today. It was a hell of a work out. And finally I was amazed to get home and see that the IDF live at FIL video has gotten over 8000 hits just today. Wow, thanks to Hiroshi for putting a link on his blog and thanks to everybody for watching. Nice day. I uploaded the video edit of one song from the IDF live at FIL store in Tokyo. That concert was back in August of 2007. I saw a few days ago on Hiroshi’s blog that the whole concert is now avalible on iTunes. So you should download a copy of that if you can. Or you can pre-order the upcoming CD @ amazon The music is great and the vibe is real cool. I just happened to be in Tokyo last August so I asked Hiroshi if I could film the concert. It was just me, Uemura and AK filming that night. I combined all the footage together along with some other shots of the FIL store that I shot the next day to make the video clip. I originally edited the entire concert, but we decided to just focus on one song as the main clip. Maybe someday I will upload the entire concert. For now though check out the IDF cover of My Ever Changing moods. Any plans for the weekend after Golden Week? No? 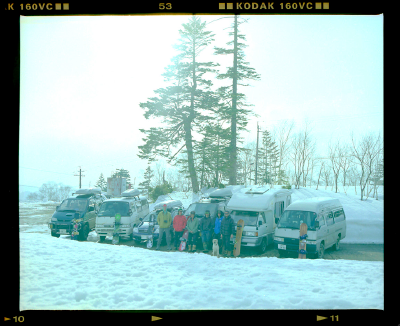 Good than how about joining us for the TNF Backcountry meeting in Tateyama. You can check out all the details here at the TNF web site. I am going to be there of course so if you want a free lesson in mountain photography sign up and I will see you there! Most of the North Face snowboard team will be there and Shimo from the ski team as well. It is going to be a good time. Any time spent at high elevation is a good time! The main image is a photo I took of Masa Takeuchi last spring at the same event. You can also watch a movie we shot at last springs event. 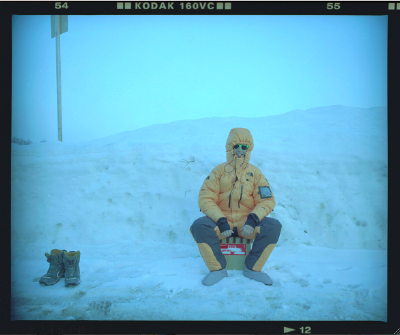 This will give you a good idea of what the Tateyama experience is like. Decided to get back to my roots and pulled out my skis! Has been at least 4 years since I skied and it was about 11 years before that when I really skied. So it has been awhile. Went up to Kokusai near the house here. Went up late in the day about 3:40pm and found myself all alone up there. The mountain was empty on Friday. As soon as I put on the skis I realized this was not going to be easy. The temperature was dropping and the chunky snow was was getting hard! The first couple of turns were rough, I had forgotten how hard skiing is! I kept looking for smooth spots as I made my decent. I only had one good crash when my skis crossed. I can’t say much for my style…. must have been pretty bad. There were three snowboarders stopped near the bottom of the course and they were watching me as I passed, I wanted to shout to them “I am really a snowboarder”, but I held it back…. Good fun though, think I will try to go up again before the resort closes for the season, maybe next time try to go early when the runs are smooth! Another email with some photos attached arrived today from Photographer Goto. He was the photographer who came to shoot the Car Danchi crew for b*p magazine last month. Apparently the photos were well recieved at the magazine and the story about the CD crew is going to be longer than originally planned. The magazine should be coming out very soon. I will let you know when it hits the news stands. Goto-san was very cool and scanned a few images and sent to me. Check this out. Again he was shooting with a Mamiya RZ on 160　VC print film. Very very nice set up indeed. There is the assembled Car Danchi crew. You can check my original blog about that day here. There I am in my North Face Himalaya down suit. That suit actually saved my life about 3 years ago when my car would not start at 4 am when the temperature was minus 35 C. The suit is good up to minus 40, but I think you can actually go much colder than that. Not that I really want to…. Really stoked on this shot hope it makes it into the magazine. Thanks again to Goto-san for the nice work hope you can come back to visit us again here in Hokkaido! Arigato! Lots of interesting things arriving in the mail recently. First I wanted to share these photos from my friend Taro who just got back from a 4 month trip to India. He left in December of last year saying that he was going to climb a 5800 meter mountain in India to watch the new year sunrise over Mt Everest. Wow, good luck was all I could say! I gave him a down jacket, Barclava, and some gloves and wished him well! 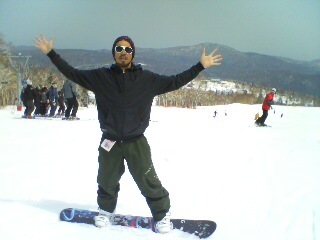 I have known Taro since he was about 14 years old and really into snowboarding. Well I am very glad that he made it back I haven’t seen him yet but he said he lost 12 kilos on the trip so you know it had to be an adventure! Check out the photos. 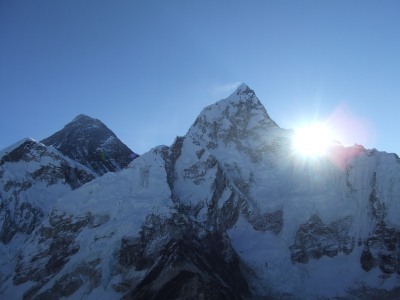 Sunrise over Everest! Amazing. 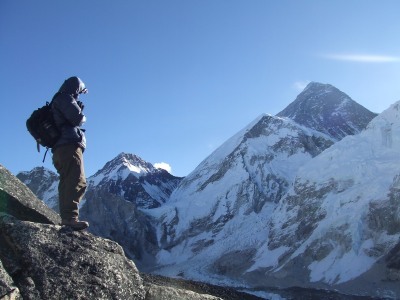 Everest does not look that big, but that is because he shot the photo from close to 6000 meters. 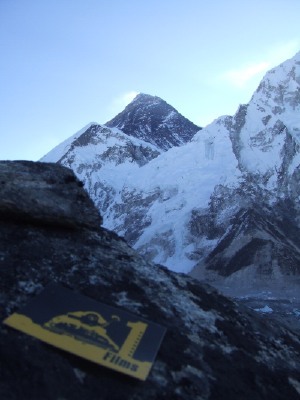 Taro represents One Films in the Himalayas! 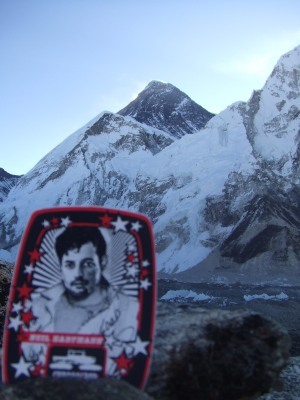 Here he goes all out with a Neil Hartmann sticker on the rocks! I feel like I have been there now! There is Taro wearing the jacket I gave him. Thanks for the great photos! Look forward to seeing you soon and hearing the whole story of the trip! Glad you are back!